I went out seeking Comet PANSTARRS (C/2011 L4) tonight. The sky was promising but, as we all know, promises were made to be broken! As the sky darkened the little comet became visible through binoculars. 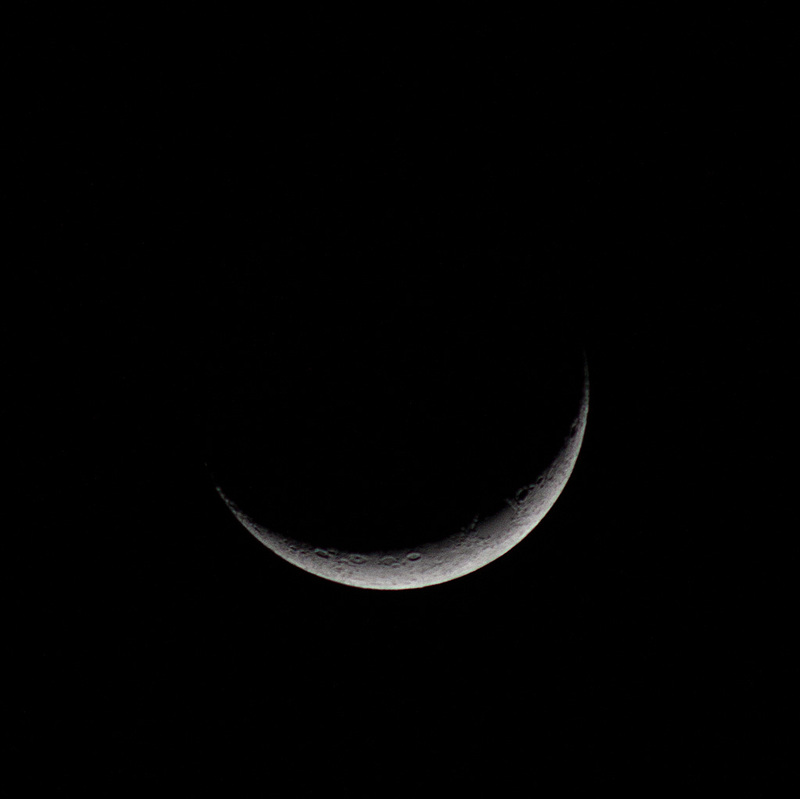 A thin crescent Moon, reminiscent of the fabled Cheshire Cat’s grin, presided over events. Soon, bands of thin clouds encroached. The comet began fading in and out. Finally, by 9:00 PM, after perhaps only a half-hour of visibility, it was gone. It was easy for them to quickly find and capture the dim apparition in the twilight. I had shared a parking lot with, perhaps, a couple of dozen cars. Folks exclaimed “cool” and “awesome” as they spotted our little visitor. Then they headed home. I looked around just about 9:00 and realized I was the only person left there! It was, after all, a cold night (32 F) for standing out in the open hoping to see a comet only briefly visible through binoculars. I chose to make my photographic efforts with my 400mm telephoto; makes sense? No. Those with the greatest success, both technical and aesthetically, used 70mm and short telephoto lenses. I tried a few non-tracking astrophotographs –all of them disappointing– and headed for home. So, I didn’t get a useable photo of the comet. I did, at least, see it. How many comets do most of us see in a lifetime, anyway? I believe I’m up to five!